This article was first published in The Magazine, Issue 7. Competitors in the 2012 Classic Tetris World Championship warm up before their Round of 16 matches. Photo © 2012 Chris Higgins. Dual ironies compete. Mullen and Steil are tight friends in the competitive Tetris community, although I didn’t know that as I watched them last September. They also rank among the top NES (Nintendo Entertainment System) Tetris players in the world. 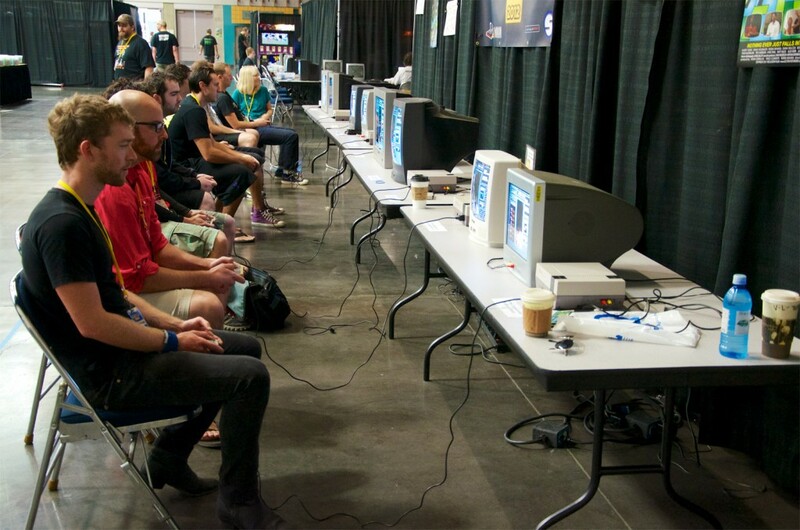 Mullen chooses to begin play on level 18, the highest allowable starting point.2 At “GO!” the pair press START on their NES game controllers — which are nearly as old as they are3 — while a crowd looks on, clustered behind a line of blue masking tape on the concrete floor of the Oregon Convention Center. Neither competitor can actually win. NES Tetris cannot be defeated, even in a so-called “max-out” game, in which the top possible score of 999,999 points is achieved. Every game ends with a player topping out and losing.4 Yet the best possible loss is exactly what these men seek, though each hope to win the Championship first. Mullen, a 30-year-old college advisor from Minnesota, takes the first game with 308,237 points.5 Steil tops out at 253,539 points, and the thrift-store CRT television connected to his NES shows an end-game animation. I put on my best referee voice: “Good game, guys!” Neither man smiles. They hardly look at each other. Steil wins the second game, forcing a third game as a tiebreaker. In that final game, Mullen tops out, and his frustration is obvious. He runs his hands through his shaggy brown hair and frowns, fiddling with his controller as Steil quietly slams tetrominoes into place.6 Steil keeps an eye on the score box, and drops his controller the instant he beats Mullen’s score. I record the results, pass them to the head referee, and Steil crosses the blue-taped line as a quarterfinalist. He is eliminated early in the next round. Mullen and his wife, Mary, return to Minnesota after the loss on September 30. But Mullen doesn’t quit. At home he plays what he calls “Rage Tetris,” inspired by frustration.10 Exactly one week after his Championship loss, Mullen posts a photo on Facebook: It shows the NES Tetris high score screen, revealing that BEN M has achieved 999,999 points. Ben Mullen watches as his friend and competitor Matt Buco is eliminated from Championship play. Photo © 2012 Chris Higgins. It’s clear that Steil has at least one abiding ambition: Tetris mastery. Steil quit college two classes short of a bachelor’s degree, and his high school career was mixed, as he didn’t bother to do homework. “In algebra, I’d actually sit and play Tetris on my TI-83 calculator during the majority of class. I was the #1 calculator Tetris player in the school.” He currently ranks #13 in the world, and plays every evening in an attempt to max out. Steil’s quest for Tetris supremacy started more than a decade ago. He began taking Tetris seriously in 2000, and his goal was to clear as many lines as possible.14 He set a personal record of 292 lines in 2001 (though he didn’t verify the record with Twin Galaxies, the de facto video game high score arbiters) and signed his own Tetris cartridge in victory. He then hung up his controller. But then in May 2012, Steil went to an Ecstasy of Order screening in Minneapolis. Mullen was there to introduce the movie and to host a mini-tournament beforehand. Steil met Mullen for the first time when they played a match together, which was Steil’s first game of Tetris since about 2001. Steil was shocked by Mullen’s ability to play smoothly on the high levels, and Mullen won that game. But Steil proceeded to beat all the other entrants, earning him free tickets to the show. The men became friends after discovering they lived an hour’s drive apart and that they had independently sought the same Tetris lines record for more than a decade. Just four months after that first meeting, Steil had upped his game enough to eliminate Mullen in Championship play. Steil often starts his Tetris training sessions around 1 a.m. He continues until as late as 5 a.m., then sleeps before it’s time to work in the blue tape factory. 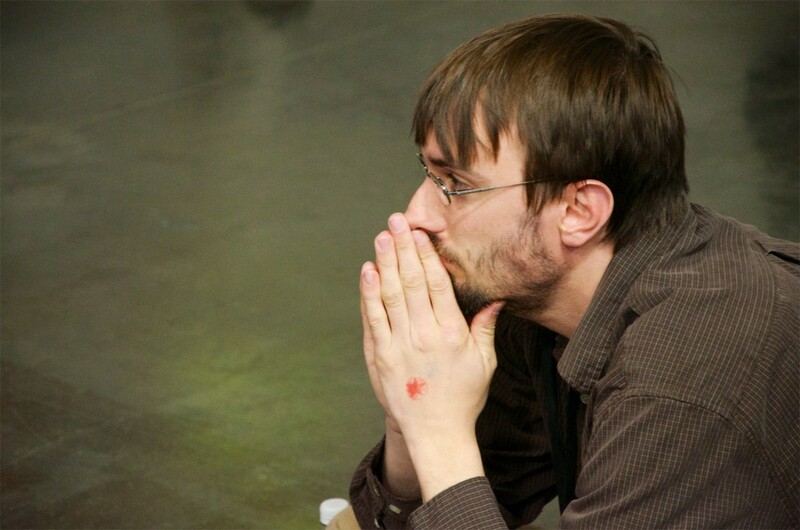 He is driven, and his rise to Tetris prominence has come fast, although it’s a lonely game. “It is a battle with yourself. That’s who you play with over and over,” he told me. It’s rare that he has the opportunity to interact with other players in person. Despite — or perhaps because of — the intrinsically solitary nature of their game, Tetris masters have formed a community online. All the top players are Facebook friends, and many have become friends in daily life. This leads to friends constantly both competing against and encouraging each other. This is the core of competitive Tetris: a group of friends who all want to win, but feel bad about beating each other. Steil told me he didn’t want to play Mullen at the Championship (and indeed I had no idea the players knew each other at the time), but the luck of the draw pitted him against his closest friend in the community. The fact that Steil was eliminated in the quarterfinals (making him #8 in the Championship overall) was bittersweet: Steil had arrived as a serious player, but he got there by beating his friend. After Mullen maxed out, I asked him how it felt. He had four answers. “Great, because it’s so hard to do. Liberating, because now I can play for fun. Relieving, because so many great players are fighting for position all the time. Bittersweet, because the chase is now over.” It’s instructive that Mullen feels he can only now “play for fun”; he has the attitude of a professional athlete who has reached a level of mastery in a sport and can look again at what drew him to it in the first place. After maxing out NES Tetris, Mullen turned his attention to its sibling: Tengen Tetris, an alternate version of the game that was briefly on the market in 1989 before it was the subject of a legal battle. Tengen Tetris differs from NES Tetris — it has a multiplayer mode and a co-op mode, and most importantly it reaches a stable top speed. Unlike NES Tetris, which speeds up with every level, eventually breaking most players with the brutally fast level 29 “death screen,” Tengen Tetris tops out at a comparatively leisurely pace on level 17. This, combined with a score counter that flips over and restarts19 rather than stopping at 999,999, means that Tetris masters can play indefinitely, limited only by endurance. On November 20, 2012, Steil decided to try his hand at a Tengen Tetris marathon. Tetris legend Thor Aackerlund (winner of the 1990 Nintendo World Championships) held the world record on the game, having scored 3.5 million points during a marathon session in 2010. Steil spent over four hours playing and scored 10.4 million points, shattering Aackerlund’s record.20 He stopped only because he had to go to work. Steil is still actively pursuing an NES Tetris max out, playing with the same steady intensity that earned him a spot in the Championship. When he’s not playing NES Tetris, he plays Tengen, and he has begun playing in co-op mode with Mullen, simultaneously dropping pieces into a single gigantic well. With Tengen Tetris, the pair can finally play together and share their victory; Mullen says they plan to set the high score record for cooperative play. Despite this newfound sense of shared accomplishment, both men intend to compete in the 2013 Championship and “win” as best they can. Update, 29 August 2013: Bo Steil maxed out NES Tetris today, after months of effort. You can watch his 999,999-point performance on YouTube. This article was originally published in The Magazine, Issue 7. It took me several months to report and write, and after its exclusive run in The Magazine, I had a choice: should I put it on my website for free, put it up for sale on Kindle/whatever, or leave it solely at The Magazine where some readers can’t access it? For lots of reasons I chose to make it free. If you want to support my writing, you can buy my book about making a living as a writer (or borrow it if you’re a Prime member — that still kicks money to me), get me something from my wish list (if anyone does this I will be shocked), follow me on Twitter, follow me on Google+, or just drop me a line. What’s next? More articles in The Magazine, in Mental Floss, and beyond. Do You Know the Coders of NES Tetris? I’m working on a followup story, and have been searching for anyone on the team that coded NES Tetris. The Tetris masters I’ve been interviewing for all this time are curious about the process behind the creation of the NES version of the game. If you know anyone who might have a lead, please contact me so this bit of video game history can be recorded. Great article. Lots of information beyond Tetris. The L Prize bulb is pretty nice. Worth it! Did your book from your wishlist arrive?